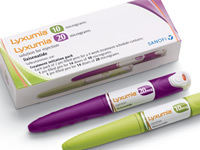 Lyxumia is a glucagon-like-peptide-1 (GLP-1) agonist that is taken once daily among people with type 2 diabetes. Lyxumia is the market name of lixisenatide and was approved for European use in February 2013. The primary benefit of Lyxumia is improved blood glucose levels, and it can be taken alongside other type 2 diabetes medication. How does Lyxumia (lixisenatide) work? Lyxumia mimics the action of the hormone called GLP-1, which is normally released by the body following food intake. It works by attaching to GLP-1 receptors on the surface of pancreatic cells which produce insulin. Lyxumia then activates these receptors, which causes insulin to be released and helps to reduce blood glucose levels in people with type 2 diabetes. Lyxumia also suppresses the release of glucagon – a hormone that increases glucose production by the liver – and reduces the rate at which food reaches the intestine from the stomach, which slows down the absorption of glucose. Lyxumia is injected once daily subcutaneously (under the skin) in areas including the upper arm, abdomen or thigh. It should be injected in the hour before the first or last meal of the day. It comes in a solution that is usually prescribed at a starting dose of 10 micrograms once a day. This is then increased to 20 micrograms once a day after 14 days. You should not take two injections on the same day. If you forget your normal injection, take it in the hour before your next meal. Lyxumia is for people with type 2 diabetes whose blood sugar is not controlled by long-acting insulin or oral antidiabetic medication - such as metformin, sulfonylureas or glinides - alongside diet and exercise. Lyxumia is not to be used in people with type 1 diabetes, or people who are pregnant, breastfeeding, under 18, receiving dialysis or have severe kidney failure. What are the side effects of Lyxumia? Hypoglycemia is a common side effect of Lyxumia when used in combination with glucose-lowering medications, such as insulin, metformin or sulfonylureas. Allergic reactions have been reported in less than one in 100 patients using Lyxumia, while dizziness, indigestion and back pain are other less common side effects. You should refer to the package leaflet to see the full list of side effects of Lyxumia, but be aware that medicines and their possible side effects can affect each person in different ways. Can Lyxumia help me lose weight? The Evaluation of Lixisenatide in Acute Coronary Syndrome (ELIXA) trial found that lixisenatide provided a modest benefit in terms of weight gain for patients. This is because Lyxumia and other GLP-1 agonists help with weight loss mainly by decreasing appetite. Weight loss is an important aspect of treatment for people with type 2 diabetes.